Union will not cooperate with ICE and will support immigrant members with legal services and advocacy. Following the deportation of a long-serving Teamster member last week, Teamsters Joint Council 16 today passed a resolution to become a “sanctuary union.” As a sanctuary union, the Teamsters will not assist federal immigration agents in deporting its members and will proactively provide trainings, legal assistance, and organize support for immigrant Teamsters. 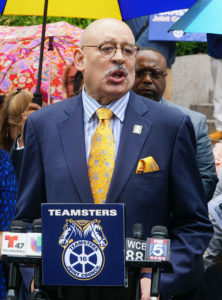 Joint Council 16 and its 27 affiliate local unions represent 120,000 workers in New York City, Long Island, the Hudson Valley, and Puerto Rico. The action follows last week’s deportation of Eber Garcia Vasquez, a 26-year member of Teamsters Local 813. The union had circulated petitions, organized members across the country to call U.S. Immigration and Customs Enforcement for his release, and held a rally outside of ICE’s New York City office. Despite widespread outcry, Garcia Vasquez was deported on September 6, 2017. Under the resolution, the union pledges to not cooperate with ICE and to not collect information that could be used in immigration proceedings. The union will hold “Know Your Rights” trainings and share legal services with immigrant members. It will seek to bargain provisions to protect undocumented workers in its labor contracts with Teamster employers. 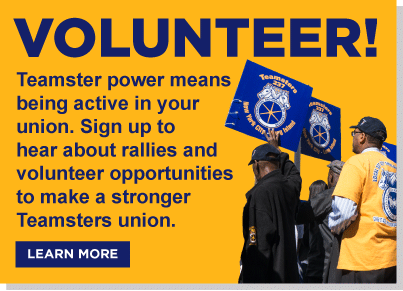 The Teamsters Union will also continue and expand its support of organizing by New York’s immigrant communities, including opposing the Muslim Ban, the border wall, and the end of Deferred Action for Childhood Arrivals (DACA).